"Poppy Flower," painted by Vincent Van Gogh, has an estimated value of about $50 million. (CNN) -- Egyptian authorities stopped two people suspected in the theft of a painting by Vincent Van Gogh, nabbing them just moments before they were to board a plane and flee the country, according to Egypt's official news agency, MENA. Egyptian Culture Minister Farouq Hosni said in a statement Saturday night that efforts to recover the stolen "Poppy Flowers" painting are still ongoing, despite earlier reports that the painting had been returned to Cairo's Mohammed Mahmoud Khalil Museum. Hosni said later that those reports were unconfirmed. Two Italians -- a man and a woman -- suspected of stealing the painting were preparing to board a plane to Italy when they were stopped at Cairo International Airport. An interior ministry spokesman told CNN that the man was arrested. The painting was stolen earlier Saturday. 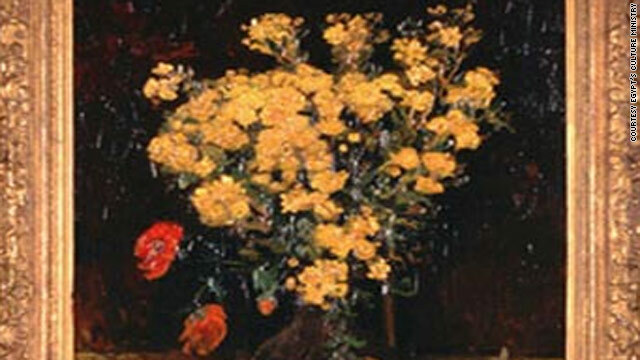 "Poppy Flowers" has an estimated value of about $50 million. It also had been stolen in 1978 and returned under unknown circumstances, causing some to think that the piece was copied in the process, according to MENA. CNN's Amir Ahmed contributed to this report.